(Phys.org)—Over a thousand years ago, an explosion in faraway space occurred that was so bright that people reported being able to read by its light at midnight. The year was 1006 and the explosion was, scientists believe now, a supernova, or more accurately, a type Ia supernova, the kind that produce the biggest or brightest explosions. But what kind of Ia supernova was it? Astrophysicists believe there are two kinds, those that happen slowly, and those that happen very rapidly. Now new research by a team in Spain suggests it was the latter after scanning the area of sky where the explosion is believed to have occurred and not finding any evidence of a companion star left behind, which would indicate a slow moving event. They have published a paper describing their study in the journal Nature. Type Ia supernovae come about, scientists believe, when a white dwarf star and a companion, such as a red giant, main-sequence giant, subgiant or even another white dwarf comingle, with the first accreting material from the second until sufficient mass is attainted to set off a thermonuclear explosion. They also believe that the process occurs in two ways, the first is where the two stars are both white dwarves, and they merge creating an explosion so powerful that both are obliterated. The second is where the first pulls material from the second rather slowly, and then explodes, leaving the companion behind. In this new research the team scanned the area where the supernova, dubbed SN 1006 in honor of the year it was observed, was thought to have occurred, looking for a companion star, which would indicate the explosion (which some believe might be the brightest even seen by human beings) was the slow happening kind. They report that no such companion star exists in the area and thus SN 1006 must have been a rapid variety type Ia supernova. The new finding would mean that there are now five documented type Ia super novae, with four being the rapid kind and just one the slow, leading the research team to suggest that perhaps only twenty percent of all such explosions are of the slow moving variety, which matters because astrophysicists use such explosions to calculate how fast the universe is expanding, which in turn impacts theories on dark energy, which appears to cause the expansion to speed up. Type Ia supernovae are thought to occur when a white dwarf made of carbon and oxygen accretes sufficient mass to trigger a thermonuclear explosion. The accretion could be slow, from an unevolved (main-sequence) or evolved (subgiant or giant) star (the single-degenerate channel), or rapid, as the primary star breaks up a smaller orbiting white dwarf (the double-degenerate channel). A companion star will survive the explosion only in the single-degenerate channel5. Both channels might contribute to the production of type Ia supernovae, but the relative proportions of their contributions remain a fundamental puzzle in astronomy. Previous searches for remnant companions have revealed one possible case for SN 1572 , although that has been questioned10. More recently, observations have restricted surviving companions to be small, main-sequence stars, ruling out giant companions but still allowing the single-degenerate channel. 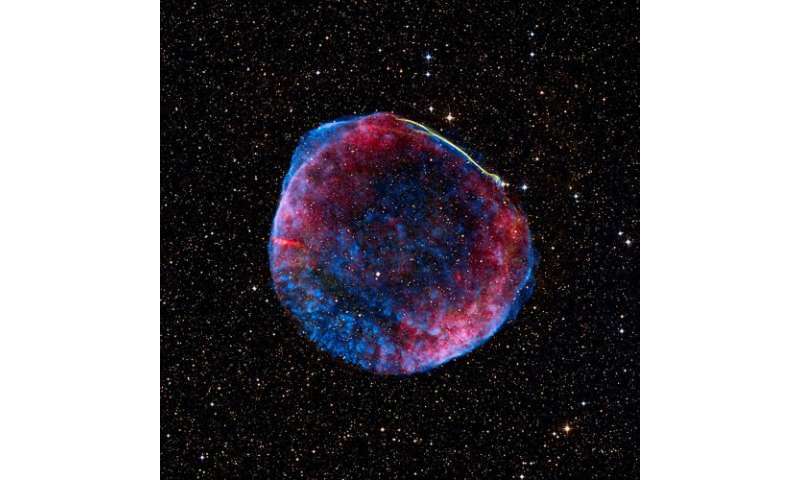 Here we report the results of a search for surviving companions of the progenitor of SN 1006. None of the stars within 4 arc minutes of the apparent site of the explosion is associated with the supernova remnant, and we can firmly exclude all giant and subgiant stars from being companions of the progenitor. In combination with previous results, our findings indicate that fewer than 20 per cent of type Ia supernovae occur through the single-degenerate channel. I suppose that 20% is a place to start , but 5 data points hardly represent a trend. If there are other data, such as ratios of dual white dwarf vs other potential 1A systems, they may support a 20% estimate. I might have missed it, but it's not clear to me how the value was derived. Twin, the 20% estimate is derived from the (admittedly) small sample of 5 supernovae studied, only one of which has been found to contain a companion star (SN 1572 - although this finding has been called into question). Part of the problem is that there is no indication that the fast channel needs to involve two white dwarfs. If a white dwarf tidally disrupts a (small) companion star, this could also result in pushing the white dwarf over the mass limit. For example imagine a red dwarf getting too close to a white dwarf. There could be little or no material from the red dwarf remaining in orbit around the white dwarf when it exploded. The reason I brought up the shaky support for the 20% stat. which matters because astrophysicists use such explosions to calculate how fast the universe is expanding, which in turn impacts theories on dark energy, which appears to cause the expansion to speed up. I didn't realize such seemingly accepted theories stood on such seemingly shaky ground.